We are seeing a common trend in the pet industry of owners feeding their dog a similar diet to the one they eat themselves. For this reason, the Paleo, vegetarian, raw and other diets are becoming popular with pets. 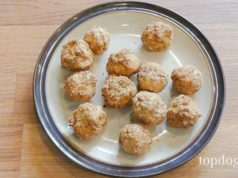 This Ketogenic dog food recipe is not an acceptable diet for all dogs, so be sure to check with your veterinarian before switching to it. The Ketogenic diet offers a high fat content, moderate protein and low carbohydrates. The high fat content leads the body to convert the fat to ketones (short-chain fats produced by the liver). Then, the body can use the ketones in place of carbohydrates. The one thing that I cannot stress enough about this diet is that you MUST work with a veterinarian and/or canine nutritionist before switching your dog to this diet. Promoting Ketosis in dogs is a delicate balancing act. You must accurately calculate the fat, protein and carbohydrates needed to start the process in your dog. Because every dog is different with their own unique nutritional needs, this calculation will be different for every dog. Some of the variables that will effect this calculation include your dog's age, weight, breed, activity level and health condition. A Keto diet is most commonly used in humans to treat seizure disorders. Some animal experts say that this diet is similar to the ancestral diet of wild dogs. Wild dogs eat a diet high in protein and low in carbohydrates. They also may go long periods of time without food, which puts their bodies into ketosis naturally. Research is currently being done, but there aren't any conclusive studies to show this diet is beneficial for dogs at this time. 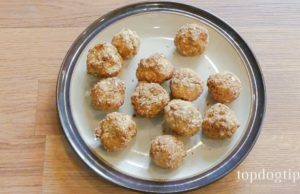 If you do choose to switch your dog to this ketogenic dog food recipe, it's imperative that you discuss this change with a canine nutrition expert. You will also have to monitor your dog's blood glucose closely when he is on a keto diet. This diet could result in nutritionally deficiencies, so it's important that you get an expert's opinion before making the switch. The following is an EXAMPLE RECIPE for a 4-year-old Dachshund weighing 15 pounds that is highly active (borrowed from The Pet Parent's Handbook To A Ketogenic Diet & Canine Cancer by Daniel Orrego – President of Keto Pet Sanctuary). This is just an example. You will need to do specific calculations before creating a Ketogenic dog food recipe for your pet. 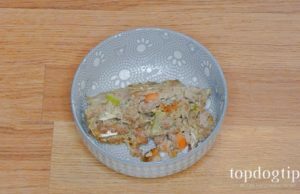 This recipe makes enough food to feed the Dachshund for one day. The recipe should be split in half to make 2 meals – one for the morning and one for the evening. This is a RAW dog food recipe. All you have to do is mix all of the ingredients together in a small bowl. Split the food into 2 portions, and feed 1 portion at each meal. The total daily calories in this recipe are 308 kCal with a 2:1 Ketogenic ratio, at 20 calories per pound. This recipe provides 28 grams of daily fat, 14 grams of daily protein, and the net carbs are 5 grams.